For our seventh day of travel along historic US-6, Roadtrip-'62 ™ is leaving Milford, Pennsylvania. Good morning again, I’m Don Milne and I’ll be guiding our virtual tour through Pennsylvania and the year 1962 today. Yesterday, we drove 84 miles from Danbury, Connecticut to get into Pennsylvania. We’ll spend several days crossing Pennsylvania, enjoying great scenery and history in the process. Route US-6 is still mostly a two lane road across the state, because it bypasses most of the large cities, except for Scranton. Today we’ll add some tasty goodies, railroads, and a surprise tonight. On the way, if you see anything you like, get on the road and enjoy it in person. This virtual roadtrip may be fun, but there's nothing like the real thing! At any time, click on an underlined word below to learn more about the places on the trip. Time for me to grab the wheel and go! Instead of returning to the diner next door to our motel, I’m going to start the day with a breakfast at a more elegant location than usual, the Hotel Fauchère in downtown Milford. It’s also a much older location than most of the restaurants I’ve been to, having opened in 1880. The hotel was originally a summer business, as most early businesses in Milford were. Founder Louis Fauchère, a former chef at Delmonico´s, catered to the New York City summer resort crowd while continuing to work during the winter months at restaurants in New York City. His connection with Delmonico´s was important to his success as it was the most famous restaurant in America in the mid-19th century. They have maintained the elegance, with a breakfast menu including a lobster omelette, buttermilk and fruit hotcakes with real maple syrup, and chipped salmon on toast. I’m going to see what they can do with their housemade corned beef hash, a favorite of mine. The menu says it’s served with a poached egg, and smoked tomato coulis, whatever that is. In Milford we meet two other US-numbered routes: US-206 and US-209: don’t get confused by the similar numbers. US-209 starts up in Kingston, New York and travels to Milford on a road that was actually part of US-6 back in the 1920s. It runs south to Millersburg, Pennsylvania, passing through the Delaware Water Gap National Recreation Area. The other route, US-206, begins here at Milford and ends only 130 miles south in Hammonton, New Jersey. If you want to spend some more time in Milford before leaving town on one of these highways, you could stop at Forest Hall Antiques. It’s a huge store with a selection of American, Chinese and European furniture, decorative accessories, paintings, and even vintage clothing. Though the store wasn’t established until 1966, you can always hope to find something from 1962! I’m choosing to leave town on US-209 and travel through a bit of the Delaware Water Gap National Recreation Area before returning to US-6. The park wasn’t established until 1965, but the Army Corps of Engineers started acquiring the land through eminent domain in 1960. The original plan was to build a dam on the Delaware River at Tocks Island, just north of the Delaware Water Gap. The dam was intended for flood control and to build a hydroelectric power plant. During this acquisition phase, the Corp demolished between 3,000 and 5,000 dwellings, including historical sites. About 15,000 people were relocated from the area and the land around the proposed lake was designated a National Recreation Area. But because of dwindling funds, growing environmental opposition, and an unacceptable geological assessment of the dam's safety, the project was abandoned. In 1978, the land was transferred to the National Park Service and gradually turned into the park we see today. Some sites within the current park were available to see back in 1962, as they had been before the Corps began acquiring land. Raymondskill Falls is the closest to Milford and is an easy ¼ mile walk off the road. It has two overlooks visible after hiking downhill a ways through the rhododendrons. Another smaller falls is farther off the road, Hackers Falls on Hackers Trail. The trail can be reached from the same parking lot as Raymondskill Falls. Making a loop from here back towards Milford, we can make a stop at the Cliff Park Inn Golf Course. This 9-hole golf course opened in 1913 and was not disturbed by the plans for a lake, because it sat on the high ground of the escarpment above the river. In fact, the Cliff Park Inn property didn’t became part of Delaware Water Gap National Recreation Area until 2003, so we could have played back in 1962. Besides the golf course, the inn was a full service facility, but the National Park Service allowed it to close in 2011 and is exploring other ways to use the property. There is access to the hiking trails from another parking lot up here. You can hike back to either of the falls, or along the cliffs on the Cliff Park Trail. That trail offers several scenic overlooks. If you choose to check out the New Jersey side of the Recreation Area, some historic structures from early Dutch settlement and the colonial period remain. The Appalachian Trail, which we crossed the Hudson River together with yesterday, also runs through the New Jersey side of the park. Completing our loop drive back to Milford, we’ll drive by Grey Towers. In 1962, this mansion and 102 acre estate was still privately owned by the Pinchot family. The family donated it to the US Forest Service the next year, and President Kennedy came as part of a 5-day conservation tour to accept the gift. Grey Towers had been the family home of Gifford Pinchot, America´s first forester and founder of the US Department of Agriculture’s Forest Service. We’ve seen some of his handiwork on our first Roadtrip-'62 ™ , at Commodore Vanderbilt's Biltmore Forest Estate, where he had worked as a resident forester. After that, he was involved with National Academy of Sciences’ Forest Commission and became chief of the Interior Department’s Division of Forestry before being elevated to head the new Forest Service in 1905. Grey Towers was built in 1886 by his parents, who encouraged Gifford to consider a career in forestry. Today you could tour the house from the end of May to the end of October. On our 1962 roadtrip, all we can do is stop at the front entrance gate in awe. Now that we’ve seen about everything we could have seen in Milford back in 1962, it’s time to get on down the road. We’ll be traveling through most of Pennsylvania in forests, so we have a lot to thank Gifford Pinchot and other foresters for. To start, only about 10 miles west of Milford is Shohola Falls Recreation Area. This state game area offers hunting for waterfowl along a small lake, and for turkey, grouse, and pheasant. But I’m here to peek at the falls. They are easily accessible down a short trail to a stone observation area. If they were any easier, you could see them right from US-6! After the falls, we hop back in the car and continue driving through the forests to Hawley, Pennsylvania. And, just as we arrive in Hawley, we can stop at an attraction from 1962. Wallenpaupack Scenic Boat Tour was started in 1962 by Thomas Gresham. They’re still offering hour-long cruises on Lake Wallenpaupack, on a style of boat they call a patio boat. The tour guide describes the area and the history during your ride. As this is a resort area, you will see a lot of homes along the shores. Boats leave every hour on the hour but if you have to wait for your tour, you can take a walk on the 1.5 mile trail up to the dam, or stop at the visitors center to see an exhibit about the lake being built. Electric utility company PPL (formerly Pennsylvania Power and Light) built Lake Wallenpaupack in 1926 as a hydroelectric project. The dam and power plant still serve as a peaking generator in times of high electricity demand. Next thing I need to do here is have lunch. The Dairy Twist seems to be the last of what was once a good collection of local ice cream places. They may not all have been around as long ago as 1962, but over the years the town has hosted The Char Bar, Smith's Old Fashioned Ice Cream Parlor, The Hut, a Tastee Freez, and Sandercock's Dairy. Tastee Freez was a chain of soft-serve ice cream places similar to Dairy Queen, that began in 1950. It was started by Leo Moranz and Harry Axene, around a soft-serve pump and freezer invented by Mr. Moranz, which an improvement on the existing equipment of the time. Tastee Freez expanded nationwide and I remember stopping at them in the early 1970s. Today, there are less than fifty restaurants remaining, with most in Virginia, Illinois and Maryland. 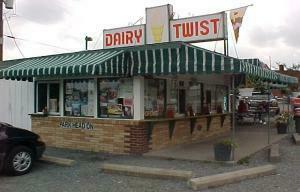 As I’m a fan of these local dairy bars, let’s try the lone survivor, the Dairy Twist. Now that I’m no longer ice cream deprived, let’s just wander around town a bit before we leave. A great natural feature is the waterfall behind Ledges Inn on Wallenpaupack Creek. Back in 1962, this was industrial property, part of the Belmont Silk Mill property. This actually was originally one of about 50 silk mills built in northeastern Pennsylvania in the second half of the 19th century. These businesses were built to take advantage of inexpensive labor, mostly of woman and children. Child labor laws cut into this labor pool in the 1920s and the local silk mill industry declined. The Belmont Silk Mill was built in1880 and produced silk until 1956, then changing to other textile products until 1986 when it closed. While the falls are not on public property, you can view them from nearby the Cromwell Avenue bridge. Part of the building has been converted into an elegant hotel, and guests can enjoy views of the falls from their rooms or from various patios on the property. If the ice cream wasn't enough and you need some sweetness to go, you might stop at Penny Lane Candies & Candles. Though this 1890 building didn't house a candy store in 1962, many of the candies they sell were around then. I'd guess that just about all the candies I mentioned on the "How Sweet It Was" page are sold here! On the way out of town, we pass Teeters' Furniture, now celebrating 160 years in business. They feature many American-made furniture brands plus an assortment of gifts. I’m not really sure what travelers like us would buy at a furniture store, but it’s great to see one that’s been in business that long. Ten miles up the road we would have hit US-106 in 1962, which ended just 11 miles east at the New York state line. We would have traveled along with it to Carbondale, Pennsylvania, where it then headed west to meet us again in Wyalusing, Pennsylvania. However, the entire route US-106 is gone today, eliminated in 1973. The roads that used that designation have been converted to Pennsylvania state-numbered highways. It was only 95 miles long and many of these very short US-numbered routes no longer exist. We’ll cross another later today. The next small town we come to is Honesdale, Pennsylvania. Just east of town are some old markers denoting US-6 as the Roosevelt Highway. This is a designation it carried in addition to the Grand Army of The Republic Highway, which you can read more about on my US-6 Introduction page. Honesdale is the beginning of Pennsylvania coal mining country for us. It’s also the beginning of railroad history country for us, which will reach its climax tonight in Scranton. The Wayne County Historical Society’s Museum houses a replica of first steam locomotive in United States, the Stourbridge Lion. This replica was built by the Delaware and Hudson Railroad Company from the original plans. The engine was purchased in England to haul anthracite coal from the mines near Carbondale to Honesdale. The coal was then barged along the 108-mile Delaware & Hudson Canal to Kingston, New York and then downriver to New York City. Besides the railroad and coal mining history, the museum has many other exhibits of the area. The Society has been around for 95 years, and since 1939 it has been in a building which was formerly the office of the Delaware & Hudson Canal company. The building was designated a National Historic Landmark in 1968. As we head out of town, a short diversion of a couple miles north on PA-191 takes us to Tanners Falls. This is another falls located at an old mill site, but there is easy access here because Tanners Falls is on state game lands. A footpath from a parking area takes you to the head of the falls, while another path leads downstream to a bend in the creek that opens to a view of the falls and the tailwaters. Back on US-6, we find the route bypasses Carbondale, Pennsylvania on a recently completed freeway. Of course, we’ll continue into town on the old road, now numbered Business US-6, all the way to Scranton, Pennsylvania. Carbondale was the home of the first underground coal mine in the United States, which was opened here in June, 1831. Mining remained the chief business in the city until the early 1950s but declined as the nation changed from heating homes and businesses with coal. The entire county declined in population over the past 50-plus years after coal left town, but is finally reasonably transitioned. Our first Roadtrip-'62 ™ down US-23 also passed through some coal mining territory in Kentucky, which has had similar problems. Scranton is also within coal mining country, and we can stop at McDade Park to see some history of that industry. The park was created in the 1970s from reclaimed coal mining property, so we would have probably seen only abandoned buildings and land in 1962. Today, you can see what’s underground on the Lackawanna Coal Mine Tour. You descend 300 feet below ground in a mine car to the abandoned tunnels of a mine originally opened in 1860. If you go, dress warmly because the temperature in the mine is 53° year round. The "miner" guide will explain mining methods and the history of the anthracite coal mines. Also in the park is the Anthracite Heritage Museum Complex. This museum completes a look at mining history by taking you into miner’s homes and neighborhoods including a local pub and a church. The museum also includes The Iron Furnaces, four massive stone blast furnaces used in the late 1800s to produce steel. The furnaces can be reached via a trolley tour from the Electric City Trolley Museum, located at our next stop, the Steamtown National Historic Site. Steamtown National Historic Site is a museum with both indoor and outdoor exhibits, showing important points in the history of steam railroading in the United States. It’s location in Scranton is fitting, for as we saw earlier today, the first steam locomotive in this country was run not far from here. The heart of the park is the large collection of standard-gauge steam locomotives and freight and passenger cars that F. Nelson Blount assembled during the 1950s and 1960s, as railroads made the transition from steam power to diesel power. In 1962 this 40-acre site was still an active railroad yard, part of the Erie Railroad which had acquired it in a merger with the Delaware, Lackawanna, and Western Railroad just two years before. As the Delaware, Lackawanna, and Western Railroad, this was a bustling coal terminal. But the railroad’s traffic had been declining as a result of the loss of coal traffic and, in 1955, flooding from Hurricane Diane devastated the mainline, cutting it in 88 places and shutting down the railroad for nearly a month. The railroad lost about $8 million due to this single event and decided many facilities were not worth the cost of replacing. 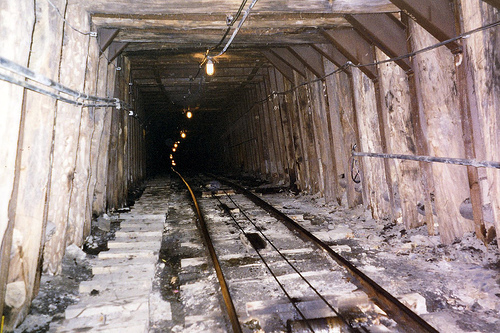 The Knox Mine Disaster in 1959 flooded coal mines along the Susquehanna River and nearly destroyed the remaining anthracite industry in northeast Pennsylvania, which lead to the merger with the Erie Railroad. Today, Steamtown still gives the appearance of an active rail yard, with a large roundhouse and engines and other rolling stock parked all over. 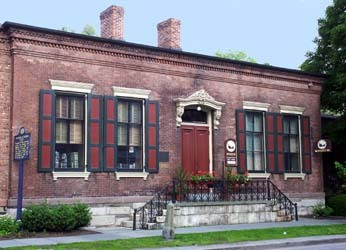 The Blount collection was brought here in 1984 by the Steamtown Foundation for the Preservation of Steam and Railroad Americana, Inc. and when the national park was created, the yard and the collection became part of the system. You have the rare opportunity to wander through the roundhouse, in between and over top of the various engines parked within. Some are undergoing actual maintenance. The museum includes passenger coaches and freight rolling stock outdoors. Indoors, they have very well done and informative exhibits of archival and photographic materials related to railroading, and even archeological objects recovered from within the park. I spent a over an hour just reading exhibit signs! Steamtown also offers excursions, using both steam and diesel locomotives, which mirrors the period around 1962 when both types of power were in use. Steamtown is the last attraction we can fit in today. But there is more of interest to see driving around town. An appropriate place to stop and pick up some supplies is a Rite Aid drug store, because the chain began here in 1962, as Thrif D Discount Center. Alexander Grass incorporated in 1958 as Rack Rite Distributors to provide grocery stores with health and beauty aids, and other nonfood products. He was well positioned to take advantage of a change in federal fair trade laws that happened in 1962. You might wonder why Walmart, K-Mart, Target, and a plethora of local discount stores blossomed around the country in that year. It had a lot to do with Congress finally repealing "fair trade" laws that set minimum retail prices on many goods. Instead of creating fair trade, these laws let manufacturers set high prices. These laws were left over from the war years and eliminating them opening the flood gates of innovation for discount stores and the vigorous competition that followed. By the end of 1962 Thrif D had booked triple its first-year projected sales of $250,000! The name Rite Aid was adopted in 1968, and today is the third largest national drugstore chain. Over the years since, the company has purchased many smaller chains in addition to building new stores of its own. One reason you can find can find Rite Aids along our US-23 roadtrip route is because in 1995 Rite Aid acquired Perry Drug Stores, then the largest drugstore chain in Michigan. Driving around, I discovered another Scranton business that started in 1962: White Sewing Center. It reminded me that back in 1962, sewing your own clothes was very common. There were several companies such as McCall’s, Butterick, and Simplicity that sold hundreds of patterns. Simplicity had a pattern magazine you could subscribe to! Junior high schools taught all girls how to sew. And the dime store on main street in every town sold fabric, buttons, and everything else you needed. But today, it is a dying art. McCall’s, Butterick, and Vogue are now all consolidated in a single company. Schools don’t teach sewing anymore, and dime stores don’t exist. Which makes White Sewing Center all the more remarkable for staying in business for 50 years! Their website notes, "We are dedicated to ensuring the art of sewing never dies. Our mission is to enable the younger generation to learn to sew and keep the art alive, by offering sewing and quilting classes to children starting at the age of 10 years old." Once again, it’s nice to find something that hasn’t changed. We meet a couple more US-numbered routes in Scranton. US-611 began here and in 1962 it ran southerly to Penn Square in Philadelphia. The route number was eliminated in 1972. We also meet US-11, which travels with us west to Factoryville, Pennsylvania. This route is truly transcontinental, running from Rouses Point, New York, near the Canadian border, to New Orleans, Louisana. For six weeks after Hurricane Katrina in 2005, US-11 provided the only route into New Orleans from the east, crossing Lake Ponchartrain on the only bridge from that direction that was not significantly damaged. Scranton has a lot of old monuments to see if you’re just cruising. 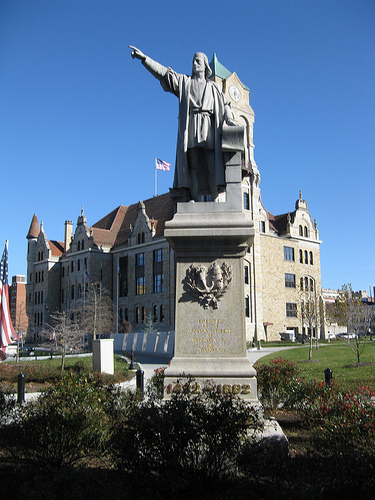 Christopher Columbus is on the courthouse grounds, along with George Washington, General Philip Sheridan, and others. Other sights are not so pleasant. If we were here on March 30, 1962 we might have seen a massive fire that left 17 families homeless. This tragic fire started out as a brush fire near Railroad Avenue and Emmett Street. The Scranton Times reported that the fire was so massive that all the fire units in Scranton were on scene along with fire companies from area communities. Even crews from distant Wilkes-Barre answered the call. In addition to the fire companies, 135 Scranton policemen and the entire Department of Public Works were also on duty to assist. Time for dinner before we stop for the night. In a city the size of Scranton, I’m sure there many places that were here since 1962. I’m going to try Stirna's Restaurant. Though newly renovated, this family dining restaurant was opened by the Stirna family in 1908. It’s just off old US-6. Customer favorites include the Stirna-Burger and Stirna’s Brownie. I’ll have to try that brownie for dessert, maybe with the baked meatloaf for dinner: I love a good meatloaf. After dinner, we need to go to a drive-in movie! I didn’t tell you as we drove into town, but we passed the Circle Drive-In just before we crossed the I-81 freeway. 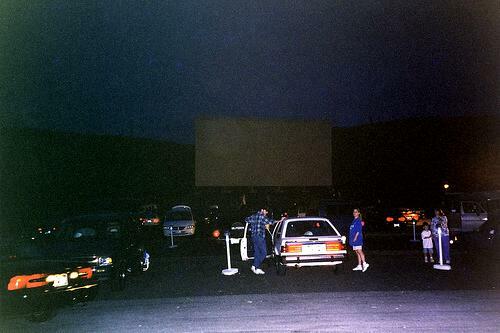 The Circle Drive-In opened in 1949 and is still operating with one screen. In the off season, it also hosts northeastern Pennsylvania's largest flea market every Sunday. I haven’t yet counted how many open drive-ins there are along US-6, but because this route is longer, I’m betting there will be more than we saw along US-23. We saw one on Cape Cod, I know of one more in Pennsylvania, one in Indiana, and there must be one taking advantage of the year-round good weather out in Los Angeles. The rest will be surprises! Wonder what was playing today in 1962; perhaps the first James Bond movie, "Dr. No" or an Elvis Presley or John Wayne movie?